In this age of technology, does handwriting matter? According to research, the answer is yes! Children’s Occupational Therapists in Sydney’s northern beaches explain how helping children with their handwriting benefits their learning and development. Some people argue that handwriting instruction for students is outdated. However, recent evidence suggests strong links between handwriting, memory and broad educational development. In fact, according to a number of studies, children not only learn to read more quickly when they first learn to write by hand, but they also are better able to generate ideas and retain information. Why is handwriting so hard for some kids? When the physical act of writing is challenging, it interferes with being able to ‘show what you know.’ It’s not surprising, then, that some children dislike writing because it is difficult and may resist doing so. Encourage your child to do shoulder exercises before every handwriting task. These will help strengthen and stabilize the shoulder muscles to free up the hand muscles for handwriting. If your child gets tense and tired easily during handwriting, then try these exercises as a break. Set aside 2-3 minutes before each writing task to ‘wake up’ the hands with a fine motor activity. Exercises with theraputty are ideal, as they provide resistance and strengthening for the small muscles in the hands and help develop fine motor skills. They may also be used as a break if your child starts to lose focus. Handwriting practice does not need to be limited to using a pencil and paper. Be creative! Ask your child to write in the air, in sand, or on an iPad using his finger or a stylus. This enables a learner to “feel the letter” and anchors the memory of its shape. Let your child try different writing implements and/or pencil grips. Thicker pencils can be easier to control for younger students. Tools such as ‘The Pencil Grip’ comfortably guide a child’s fingers exactly where they should go and keeps them there while he writes, decreasing hand fatigue and pencil pressure. Placing a weight (such as a few nuts secured by rubber bands) on a child’s pencil can be helpful for those who exert too much or too little pressure or for those who need slowing down! 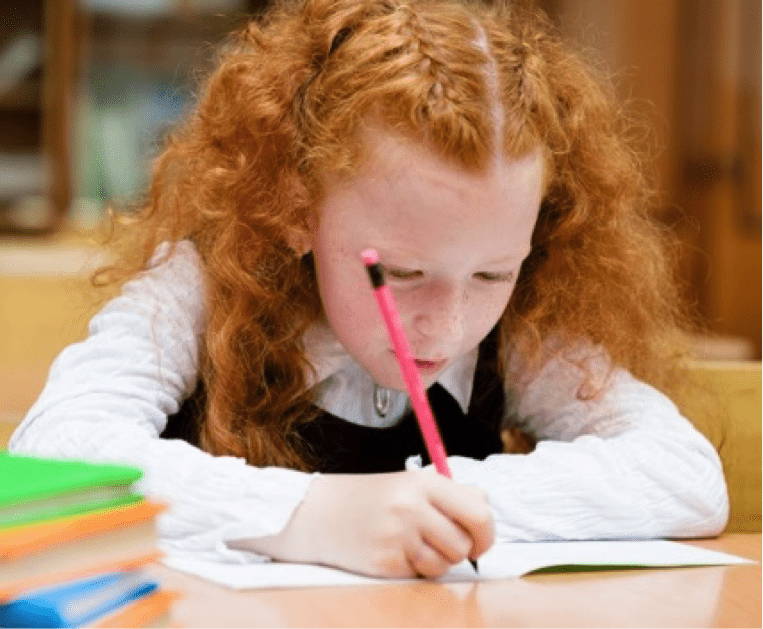 Encourage children to review their own writing, using a ‘Handwriting Checklist’. This may include elements such as: 1) My letters are the correct size, 2) I have all the correct spaces, 3) All my letters are on the line (no letters sinking below or floating above the line). Make practice fun and functional. Encourage your child to write lists (shopping, holiday packing, camping, to-do, what to take on an outing). Other ideas include: thank you cards, invitations, letters to friends and family, or a holiday journal. The key to success is giving your child lots of positive reinforcement! On tasks where creative input is required, your child may be able to write more freely and easily if freed from the effort of writing neatly. We all understand that a neat final draft may be required, but it’s okay to let your child use a computer to type their first draft. Similarly, their handwritten scrawl may not be for their teacher’s eyes…. at first, being allowed to write without having to try hard to be neat may get the creative juices flowing. Worried about your child’s handwriting? Kids First’s paediatric occupational therapists have supported hundreds of northern beaches children as they have improved their handwriting…and we can help your child too. Kids First offers one to one occupational therapy support that will provide tailored support to your child. Our popular Write Away groups for children in Year 1 and Year 2 also ‘nip handwriting problems in the bud’ before your child’s learning and academic success is affected by slow or uncomfortable handwriting habits.